Guess what? I finally did it. I finally painted my master bedroom and ripped up the horrible eggplant purple carpet. Last week was crazy painting, priming, and carpet removing. I will share more about the transformation on Friday so check back! 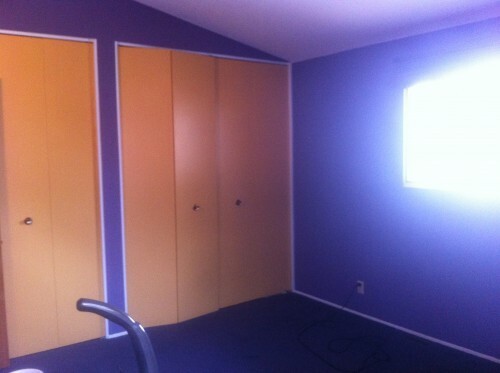 The deep dark eggplant purple walls and carpet with accenting yellow closet doors. The purple is gone and the carpet is gone and it is so wonderful! With last week’s craziness I did very little cooking of actual food. Ordering take-out because your kitchen is a disaster zone or because your bedroom in now in your living room/dining room kind of takes the joy out of getting take-out. Too much bad food puts me in a major cooking rut which I am slowly digging myself out of. Starting back by making something simple. Sometimes simplicity is just what is needed. Bruschetta [pronounced Brus ketta] the lovely little appetizer from Italy. I could eat this by the truckload. Trader Joe’s had the most adorable variety pack of heirloom tomatoes that was destined for bruschetta. I can’t wait to harvest my own tomatoes and basil this summer. 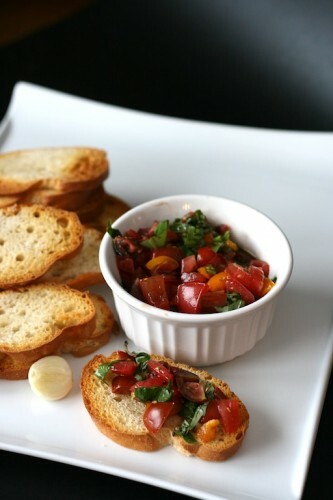 In the past I would add minced garlic to my bruschetta and let it mingle and get friendly with the tomatoes and basil. This time I made it the traditional way without garlic. Instead of adding garlic to the chopped tomatoes and basil, you rub a clove of garlic over toasted baguette. WOW! So simple yet so full of garlicky flavor. I highly recommend it. Preheat oven to 400 degrees F. Brush the 1 tablespoon of olive oil on the baguette slices. Bake for 5-7 minutes until golden brown. In a nonreactive bowl place tomatoes, basil, vinegar, olive oil, and salt. Stir to combine. Set aside until bread is done baking. When the bread is done rub one clove of garlic on all the slices. 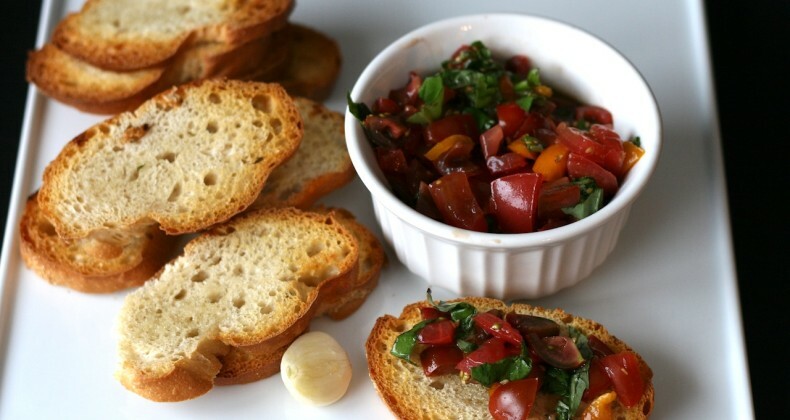 Place a spoonful of bruschetta on a baguette slice. ENJOY!